2012 is only half over, and it isn’t impossible that my current nominee will be toppled, but I don’t think it likely. 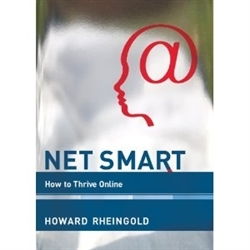 Howard Rheingold’s Net Smart: How to Thrive Online is terrific: ambitious in scope but humble in tone; enthusiastic about opportunities but tempered by the recognition of the risks and downsides; sweeping in its broad-brushed depiction of our new era of empowerment and participation while specific in its suggestions of precise techniques and initiatives we can take to best leverage our staggeringly new connectivity. It should be said that this valuable book is a bit more work than most of the other titles mentioned above. Johnson’s book was popular in airports, published by mainstream presses and written in a very general non-fiction manner, intended for wider audiences and reasonably easily read on a cross-country flight. Brown’s book is breezy and accessible, with large font and charming anecdotes, easily able to be read over a 90 minute flight. Rheingold, by contrast, is published by MIT press, with smaller font size and a greater seriousness— it isn’t an academic monograph, but will take more concentrated and extended attention than the others. As I noted already in my previous post, Rheingold deserves great credit for his carefully nuanced balance of enthusiasm and sobriety about digital engagement and connected-ness, for which I am so appreciative. Digital media is (or are, if you prefer) a great gift to us and to our abilities to form community, to collaborate and create, and to gather information and to contribute information, to participate and contribute to the wider world in ways we never had before. Used mindfully, how can digital media help us grow smarter? My years of study and experience have led me to conclude that humans are humans because we invent thinking and communicating tools that enable us to do bigger, more powerful things together. Digital media and the networks digital media make possible create new opportunities for citizenship, for civic engagement and social-political impact, that are ushering in a new era, an era that is very exciting and meaningful. Rheingold’s chapter on Attention offers valuable suggestions for strengthening our mindfulness by using meditation, goal-setting, “intentionality,” and other tools to become more metacognitive and more intentional about how we concentrate in the times when we choose to do so. In a very valuable way, he also engages with the critics, with the authors such as a Carr, Turkle and Johnson. This section deserves commendation especially for its remarkable tone: would that we were all (would that I were) so respectful, nuanced, and honorable in addressing the ideas of our intellectual opponents. We’re facing a similar challenge to the arrival of the printing press, caused again by abundance, and taking it on again will again mean altering our historic models for the summa bonum of educated life. It will be hard and complicated; abundance precipitates greater social change than scarcity. But the older habits of consumption weren’t virtuous; they were just a side effect of living in an environment of impoverished access. Nostalgia for the accidental scarcity we’ve just emerged from is just a sideshow; the main event is trying to shape the greatest expansion of expressive capability the world has ever known. Rheingold embraces rather than refutes Jackson: “I see the same possible chasm that Jackson foretells. I’m looking for ways to climb out. I don’t see myself arguing with Jackson; rather, I see myself attempting to answer her challenge.” Before reading Rheingold, I think I might have “seen myself arguing with Jackson,” but now, I too want to rise to meet her challenge. I conclude that teaching people how to practice more mindful, mediated communication seems like the most feasible remedy…. I’m with Jackson; self-control along with the skillful use of attention, participation, crap-detection, and network awareness through social media ought to be taught to future netizens at early as possible. But Rheingold doesn’t just end it on this note. He returns to remind us that sometimes we should delight in distraction and diversion; sometimes we will learn the most if we let ourselves ramble and roam the range of the far-reaching internet, tripping link to link encountering what emerges and enjoying the serendipity of unexpected discovery. We need to be intentional: what is my goal for this session, this time-frame, and how can I best achieve it? The war on distraction can go too far for your own good– Distraction is a real issue, but dwelling exclusively on its dark side can be a form of selective inattention. The meaning of unproductive, like distraction, requires both context and a firm idea of one’s goals. If your aim is to produce a certain amount of external output, as opposed to the more internal production of learning), then the invitations to serendipity, play, and digression that digital media offer are obstacles and dangers. If your aspiration is to learn, help build community, and explore, then the issue gets more complicated. Here is offered a wide variety of techniques and tools to improve your search skills and your crap-detection. Triangulate information, seeking three independent sources of confirmation. Use FactCheckEd.org and Snopes, and use tools for determining a site’s author and traffic such as alexa.com. Consider for each event: what is the importance of having the facts just right, and then align your research accordingly. On Google, “write the answer you want to get” when formulating search inquiries. Add “critique” or “criticism” to your search subject to get contrary opinions. Rheingold also has a high school curriculum for crap detection which deserves consideration for integration possibilities at every high school. Like J.S. Brown in A New Culture of Learning, Rheingold sings the network electric, and offers several chapters of close examination of the power online networks provide their users and advice on developing and shaping a network. There is a lot here, more than I can recapitulate in this post, but it very useful and very comprehensive. I enjoyed his suggestions for joining virtual communities, beginning with “pay attention before you join in.” This spoke to me: I have always been a very quiet, sometimes silent observer when first joining a new group, studying it closely and taking cues before I jump in. Sometimes I have been praised and appreciated for this; in one recent experience I was knocked, pretty severely, for it, but I still think Rheingold is right: observe before you jump in. Next steps include assuming good will, jump in where you can add value, and reciprocate when some does you a favor. I love his message about the value of “paying it forward;” network environments make it that much more likely that a favor disbursed today will be returned tomorrow. There is also great insight into how to add value as in networks: one key technique is to be a “bridge.” Seek to serve as a connecting link from one network to another, and you will add greater value. I think for myself I have been seeking to do this, without the consciousness Rheingold has raised for me, of situating myself at the crossroads of the 21st century learning networks and those of independent schools. I am not sure I am being especially effective, but I am taking the advice here to continue to strive to serve this important intersection. A great book does many things: it is interesting and enjoyable to read; it informs and gives you practical, applicable tactics and strategies to improve your skills; it causes you to view and understand concepts and principles in new and different ways. Rheingold’s book did all these things for me. In regards tho the third and broadest of these things, it has helped me to rethink the critical issues of the importance of attention in the new paradigm, and it has expanded dramatically the way I think about and employ the concept of digital citizenship. Whether you are a veteran or brand new to the exciting Web 2.0 world of participation and networking, Net Smart is very much worth a careful, thorough read.